We can all agree that making persuasive arguments is both exceedingly critical to collaboration and exceedingly difficult. 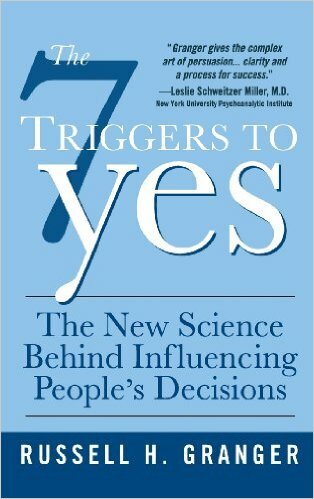 Thus, I’ve been delighted to work through a book on persuasion–The 7 Triggers to Yes. It’s a new favorite of mine, and in this post, I’ll share the seven triggers, discuss one in more detail, and describe some of the other great content in the book. The author of the book begins with one persuasive argument–that to make your own arguments, it’s better to appeal to someone’s emotions, intuition, and gut instincts, rather than to the the logical, data-driven parts of the brain. 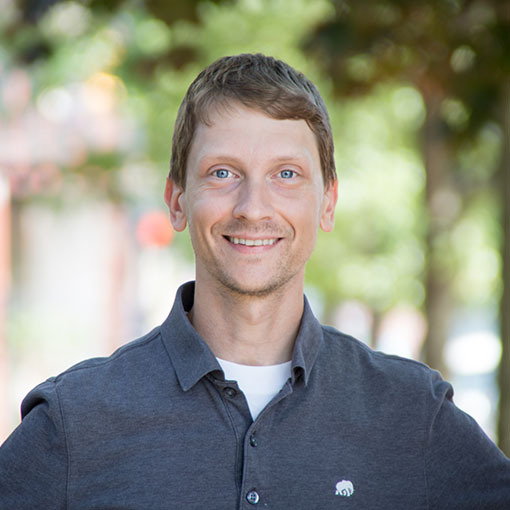 He then introduces seven tactics for appealing to your partners’ biases. 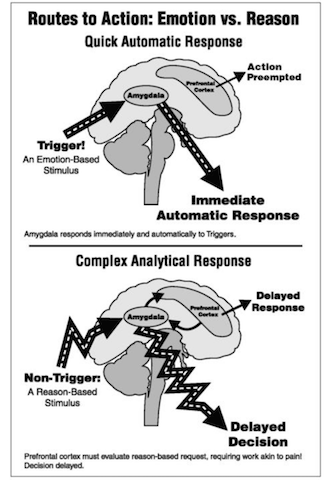 The author argues it is better to appeal to someone’s gut instincts (the amygdala) than their rational brain. Image credit : The 7 triggers to yes. Allow me to go into a little more depth on the friendship trigger. The author suggests that this trigger forms the groundwork of the others. Without first establishing a basic human connection to our partner, we aren’t going to get anywhere. Similarity is important–by dressing similarly, discussing shared interests like children, and finding a common background, we establish a base connection with others. Thus, my tip for you: When engaging with a new person, work first to get to know the other person a bit. Getting straight down to business will lead to only moderate success at best. Of course, the book also goes into much more detail on all of the triggers by introducing them, giving examples from real life, and sharing ideas for how to make use of each trigger. It concludes by providing a framework with which to form your persuasive argument–start with this trigger, weave in this other one as appropriate, etc. I highly recommend this text to anyone who needs to collaborate, which is pretty much everyone on the planet. I found the tips concrete, useful, and immediately applicable to every aspect of real life. Many thanks to Darrell Crawford of The Vantage Group for recommending this book and discussing it with me and my colleagues! Hi Matt – Thanks so much for the wonderful feature and review!! Since its original publication, the methodology from my dad’s book has been used at a wide variety of organizations via training and support tools, from Fortune 100 companies to fast-growth startups. Would be delighted to give your readers and colleagues special access to some of our resources for learning, consulting, and training. Folks can follow us on Twitter via @7Triggers, where we tweet about how persuasion works and emotional triggers are used in leadership, sales, marketing, media, and politics.